How Important Is A Good Sleep For Truckers? Sleep is essential for people of all ages and of all professions but many suffer from sleep deprivation or just don’t get enough sleep. As a trucker, who is constantly on the road working long hours, your sleep schedule changes and often times it suffers. But your sleep needs to be a priority. As important as it is to get from point A to point B, your overall health and safety is most important. If you are extremely tired, your body will let you know. At time when you find yourself highly moody and irritable, you may be experiencing early warning signs that your body needs rest and your mind needs sleep. The next stage of symptoms will include slowed or slurred speech, apathy, impaired memory, the inability to multitask and inappropriate emotional responses. If these symptoms occur, that’s your cue to get off the road. The last thing you want is to nod off while driving. Sleep deprivation and exhaustion can impair your brain just as much as alcohol. If a person is not getting enough sleep, their reaction time is longer, their judgment is impaired, their memory is impaired and their coordination is impaired. 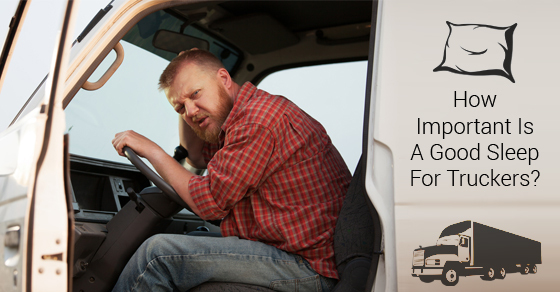 Any of these can cause truckers to cause or become involved in seriously dangerous situations. Sleep needs vary from one person to the next but the average recommended hours for adults is between seven and eight hours. Some people will be able to fully function on less but many will not be at full capacity unless they are able to get the full amount of sleep required for your body to feel restored, rejuvenated and ready for the day. How to Get into a Better Sleep Routine? Don’t smoke and avoid alcohol. Avoid eating heavy meals before sleep. Try to keep a regular sleep and wake schedule. Exercise regularly – this doesn’t have to mean hitting the gym, even a daily brisk walk will help. Minimize noise and light during rest times. Set the temperature – not too hot, not too cold. Take advantage of every opportunity to go to bed earlier. If you think you are sleep deprived or are excessively tired, speak to your employer. If your truck accommodations aren’t adequate, you don’t have enough breaks or rest stops, the hours are way too long or dealing with any other sleep related issue – it is best to bring it to their attention as soon as possible. They may be willing to work with you on this to make things better. With offices in Canada and the US, we offer truck loans, trailer loans, truck leasing, heavy equipment loans and construction equipment loans. Call us today at 1-866-230-0094, our truck loan specialist are here to help! If you will be driving for long hours, remember to take breaks and get your sleep – it is important for the health and safety of all.